Heathrow | Plane Stupid - bringing the aviation industry back down to earth! I've got to admit I was dreading today, with more Plane Stupid activists up for sentencing by the same district judge who promised prison to the runway blockaders. It's a relief that the 'tunnel trio' were charged with a fine-only offence and got off today with just an order to pay £305 each. Then we went to the pub and relaxed. It was definitely a better result than seeing activists sentenced to an "almost inevitable" trip to Wormwood Scrubs and Holloway! The 3 Plane Stupid activists had blockaded the main road entrance to Heathrow on Thursday 26 November 2015 for - the Court heard - 4 hours and 29 minutes. The maximum sentence for infringing a Heathrow airport byelaw that prohibits blocking the road is a fine of £2500. They were each fined £200 (a third reduction on £300 for a guilty plea), plus £85 prosecution costs and a £20 victim surcharge. The judge remarked that the Prosecution's low application for costs was more "generous" to the defendants than it could have been. The judge explained that she gave below the maximum fine as she had to take into account their income and ability to pay. Only one of the three activists had a previous conviction. 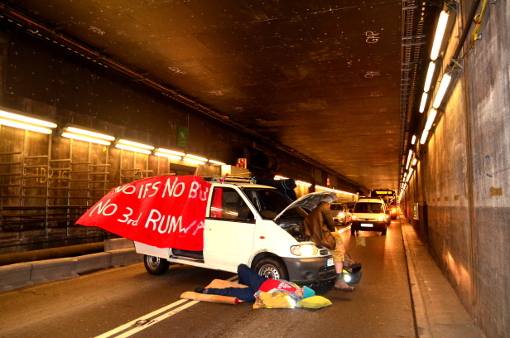 In a short court session lasting under an hour, in one of her few remarks the judge told the tunnel blockaders that their action was not effective because the runway occupation had already done the job successfully. Two months ago, she had asked at least three of the runway blockaders why they had chosen an ineffective runway occupation when more emissions are caused by other modes of transport and she felt it would have been more effective to block a road - specifically, she told them, the M25. It seems she just can't decide which Plane Stupid blockade she loves best - blockading a tunnel or a runway! Well, have both until the government lives up to its climate promises and duty of care. The day began with a laid back and fun gathering outside Uxbridge Magistrates Court. The cops weren't there, but did later turn up to be given some buttercups by a local supporter. They put them in the office. The trio read a brilliant statement outside court. After a loud cheer, they went in. There were 28 seats in the public gallery but we had been told that only 13 of us were allowed in. Along with one member of the public who wasn't a supporter watching, there were 14 empty seats despite there being about 20 supporters still outside. One of us mentioned this to the court staff, asking for more of us to be let in, but we were told, "The court sets the number of seats. It's been arranged beforehand. It's not our decision." One then added, "We've got to keep this under control." I wonder if they're worried there'll be a repeat of the last trial's terrible cheering of the activists, but in reality it wasn't really a problem as most of the other supporters were happy being outside in the sun. We showed our switched off phones to police as we entered the gallery, this being on the orders of the judge. Bizarrely, the judge's first comment as she entered the court at 10.55 was that she had received "intelligence that some of you were intending to record the proceedings. I'm sure you've all turned your phones off and are aware that any electronic recording would be an offence." Well the judge may (or may not) find court sessions fun to relive again and again, but I can promise you that we're sticking to Breaking Bad or David Attenborough if we want to watch an old recording. Even Channel 5 would be more fun to watch than a recording of court. "On the day that Parliament was debating new runways at Heathrow and a week ahead of the UN Paris climate summit, we wanted to take action which could not be as easily ignored as many campaigns have been in the past. We believe that those working in defence of local communities, climate refugees and the environment must speak up for those who do not have a platform for their voices. For most of us, all we will gain from new runways is dirtier air, more noise and more floods due to climate chaos. There are more than enough runways for people who take one holiday a year; demand for airport expansion only comes from a minority of frequent leisure flyers. This 15% of British people take 70% of our flights, often to second homes abroad and they have a high income. While the huge business entity that is Heathrow spends tens of millions advertising its plans for expansion, where are the voices of the locals whose lives will be entirely uprooted or the climate refugees who are forced to migrate as global warming increases drought? This is an issue of class: a familiar story of a rich and powerful elite trampling over the livelihoods of those lacking power. Plans for new runways at Heathrow have been found "untenable in law and common sense" in a 2010 High Court judicial review because they contradict the Climate Change Act 2008. Our sole intention was to draw media attention to the issue." The judge retired to examine the means forms and returned at 11.15. "I acknowledge that each of you was protesting about an issue that you care about passionately, on the day Parliament was debating that issue." "However, there had been another protest earlier that year that had already drawn significant media attention to the issue. It was difficult to see what your action achieved over and above that already achieved." She settled on a pronounced sarcastic tone for the last word of her remark: "your character witnesses speak of your compassion and kindness." "Your action showed a spectacular lack of consideration. Those flying may not have just been a rich caucus of people who travel frequently." And it was all over by 10.20. Media coverage of today's trial has given very little space to the issue of climate change, so I will here. It is why we are forced to take disruptive action. It is science. Most of us will have seen the harrowing images of Syrian refugees such as the toddler Alan Kurdi, whose body washed up on a beach in Turkey last year. There have been many of these tragedies. Over 4 million Syrians have become refugees. We know that climate change means that more families become refugees. Although climate change is only one factor among many, these could be the individual stories of some of an estimated 75 million people forced to leave their homes by 2035 due to climate change, which brings increased floods, drought and extreme weather. We know that, according to peer-reviewed research, climate change was a factor that helped spark the Syrian civil war, among other reasons. Public figures such as Prince Charles and Barack Obama have spoken about the link, with the US president saying: "It’s now believed that drought and crop failures and high food prices helped fuel the early unrest in Syria, which descended into civil war." In fact, his entire speech to the military about climate change is well worth reading. Even a mere 2C rise in global temperatures - now considered at the low end of realistic expectations - would eventually force the migration of 20% of the world’s population from cities flooded by sea level rise, such as New York, London and Cairo. Again, this is peer-reviewed research. If business as usual continues, numbers of climate refugees will snowball. If we burn all available fossil fuels, by 2300 most currently inhabited land may be so hot that humans would die from heat exhaustion within 6 hours. This too is peer-reviewed research. There is no planet B. We must welcome refugees because no matter where borders lie, no human is illegal. Those of us who are able to act to prevent runaway climate chaos should know that we are responsible. We are complicit in the actions of our governments if we sit by. For many of us, it is difficult to erase the photograph of Alan Kurdi from our minds. Let it remind us of the human cost of doing nothing when we could have done something. As we prepare ourselves for the likelihood of an unusually harsh sentence on February 24th - the Judge told us to prepare for prison, and implied it could be the maximum of 3 months - we sit reeling from the institutional failure of the legal system to address the biggest and deadliest problem of our time. A guilty verdict may have been a forgone conclusion in the eyes of the law, but today has been an extraordinary day for climate change activists the world over. The issue of climate change, its connection to the aviation industry, and its resultant massive loss of life have not once been disputed in the proceedings of the trial. In her closing remarks, Judge Wright said: “There can be no doubt that the defendants are very committed to tackling the problems of climate change and that they acted as they did on the 13th July in what they genuinely believed was in the best interests of the public and society as a whole”. She called us “principled” and “passionate” people. She accepted that climate change was a problem and that we were doing what we could to stop carbon emissions. This acceptance, however, appears to have had no bearing whatsoever on the verdict we have received, and the sentencing we now face. After warning us to prepare for prison, the judge said 'I cannot think of a more serious case of aggravated trespass', implying that she may give the maximum, which is 3 months inside for our charge (aggravated trespass). If we had been taken to court for more serious charges (eg, public nuisance, which we arrested for), we could have had a trial by jury. Unlike judges, juries have previously found people not guilty for similar actions. With his opening statement this morning, the prosecution lawyer attempted to paint us as crusaders against democracy, taking the law into our own hands and seeking a defence based on “criminal self-help” rather than necessity. His summation ran into the following confusing circularity: “sober and reasonable people don’t break the law”, and “it is my job to decide whether a sober and reasonable person would have broken the law in these circumstances.” Well, no surprises then when he decided that they wouldn’t have. But that was a forgone conclusion. A system that defines reasonableness as following the law can’t acknowledge the possibility of a reasonable breach. Suppose our small group had just learned that Chernobyl was about explode, Madam, and had tried to do something to prevent the inevitable and catastrophic impact on human life. Suppose our group felt compelled to act, and that they decided to chain themselves to the reactor in an attempt to physically prevent further leakage and future explosion. This group would have had both the support of the public, in whose interest they were acting, and also the support of the law. Even if the deaths from Chernobyl were somewhat removed in both space and time; even if they could not name the people who would be affected; even if the group had waved banners warning about the dangers of future expansion of the plant, the necessity defence would have been open to them, and they would have won. Their actions would be reasonable to prevent loss of life. The #Heathrow13 find themselves in a very similar situation. And this is the defence that should prevail today. Unfortunately, it has not prevailed. When Lawyer Mr Chada ended his statement with some words from Robert Kennedy, the Judge was still to announce her decision. These words feel all the more powerful now the verdict has been made. Climate change has already claimed many lives, and it is the continued negligence of governance that forces citizens to act in their stead. We are not hooligans. We are not heroes. We are ordinary people who acted against the letter of the law in the face of complete failure of the authorities to act in the service of what we, and many, many others, know to be the major issue we face today. 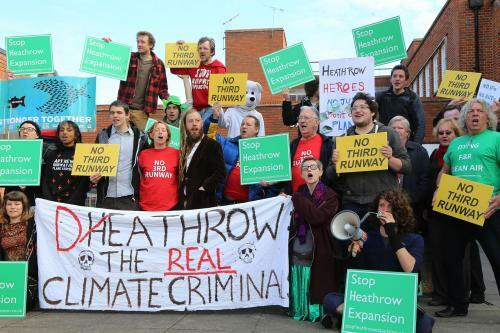 Today at Uxbridge Magistrates Court, the 13 climate change activists who blocked a runway at Heathrow airport pleaded not guilty. They are charged with aggravated trespass and entering a security restricted area of an aerodrome, forcing flights to be delayed and cancelled. 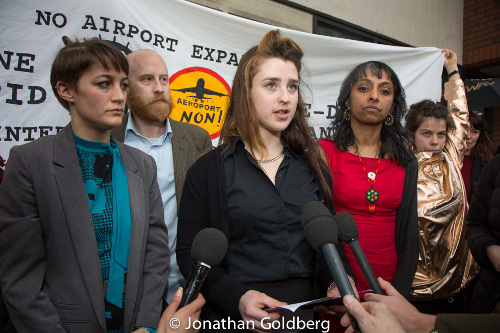 The defendants will argue in court that the runway occupation was necessary and justifiable. If aviation growth continues unchecked, by 2037 the industry will be responsible for all of the carbon that the UK can safely emit. Failure to prevent climate change will see at least one billion people suffer water shortages, 40% of species made extinct and sea level rises threatening London by the end of the century. "We didn't want to do this, but we had to. If the government won't prevent catastrophic climate change, ordinary citizens have to step up; you can't reduce carbon emissions and build more runways, it's plane stupid. There is already more than enough aviation capacity for ordinary people who take their one holiday abroad a year. Airport expansion is for the 15% of wealthy frequent flyers who take 70% of our flights. A broad movement is again uniting to make airport expansion impossible, and we're in it for the long haul!" The proposed start date for the trial is 18 January and it is estimated to last 2 weeks. In the early hours of Monday 13th July, 13 of us took peaceful direct action at Heathrow Airport. Two weeks before our action took place, the Airports Commission issued a recommendation to build a new runway at Heathrow Airport. Some of us are local residents, and the existing air traffic from Heathrow is already having a hugely negative impact on the local community by way of noise & air pollution and blight on the area. Last year more than half the UK population didn't fly. Airport expansion in the UK is being driven by a minority of wealthy frequent flyers who are booking the vast majority of flights in the UK. But the long term negative impacts of airport expansion will mean everybody pays the price. Scientific evidence is telling us that if we are serious about tackling climate change, and keeping within the safe 2 degree global temperature rise, we need to be drastically reducing our carbon emissions. But our government is clearly failing to act responsibly. Building any new runway in the UK is simply not compatible with reducing carbon emissions at this critical time, and will make it impossible to meet our legally binding commitments, as set out in the Climate Change Act 2008. It is critically important that climate change is prominent in the context of any discussion about the future of the aviation industry. Against this background, and the failure of democratic processes, we believe our actions were reasonable, justifiable and necessary.